Workers assemble poke bowls at Poke Papa last Monday during the soft opening of its new location at 1919 Pennsylvania Ave. NW. Poke Papa will serve Hawaiian-inspired poke bowls just steps from campus with a new location that opened Tuesday. 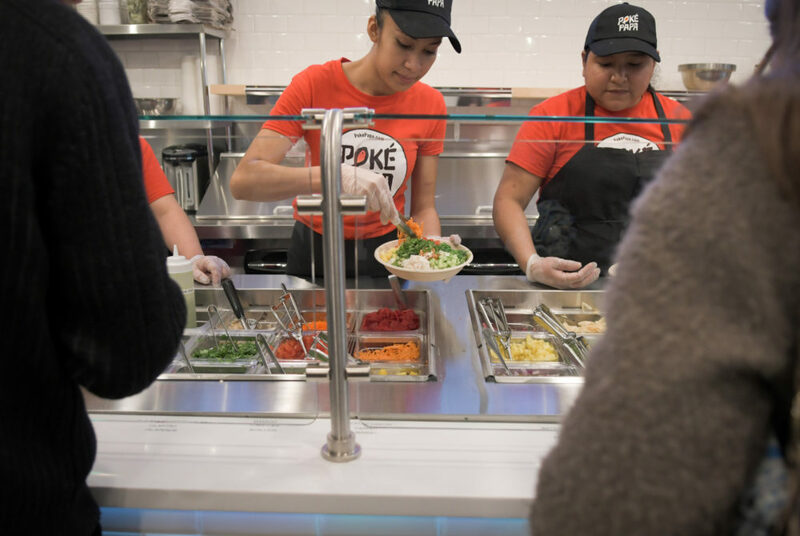 The poke shop moved in to 1919 Pennsylvania Ave. NW, the space that formerly housed Greenberry’s Coffee Co. Customers at Poke Papa can customize their meals with a create-your-own-bowl at the restaurant’s second D.C. location. Kerry Chao, the owner of Poke Papa, said the restaurant’s first shop in Penn Quarter was the first poke shop in D.C. when it opened in April 2017. More than a year later, there is a wide array of options to try this classic Hawaiian dish around the District, he said. Poke Papa offers six steps of customization with each bowl. You can choose between your poke size and number of protein scoops ($10.99 for snack bowl, $12.99 for regular, $14.99 for large, $7.49 for no protein), your base with rice options or mixed greens, and proteins including fish like ahi tuna, loi salmon and ceviche as well as cooked options like chicken and scallops. You can top it all off with a glutton of 15 sauces, 18 toppings from edamame and pickled daikon to avocado ($2 extra), and self-serve sprinkles of different seeds and crisps. Chao added that the shop will offer seasonal bowls and sauces. Inside the shop, a clean and simple aesthetic has bar stools and tables built for the lunch rush. Customers can order online and pick up the bowl in store, order at a kiosk in the shop or order online for delivery through Doordash. Chao said the shop also plans to accept GWorld. Poke Papa stocks an authentic take on poke, as the kitchen marinates the fish for many hours to absorb all of the spices in the recipe. Involved in the food industry for more than 30 years, Chao wants Poke Papa to represent true Hawaiian cuisine.